SecurityStockWatch.com: Please give us an overview of your background and your role at Pelco by Schneider Electric. Scott Paul: I have 12-years of experience with Product Marketing in both the video security and IT industries. My current roll at Pelco by Schneider Electric is as the Senior Product Marketing Manager for the Sarix family of fixed IP cameras. I manage the launch of new products and provide oversight for training, communications, product demonstrations and sales plans. I set the strategy for how to position, price and promote these cameras in the marketplace, and I work directly with our global sales force to provide support. SecurityStockWatch.com: Any new product introductions on the horizon? Scott Paul: Yes! We are very excited to have introduced a new technology that is leading the way in Image Quality. Sarix with SureVision technology is a game changer for image quality in the video security industry. This is a state-of-the-art technology exclusive to Pelco by Schneider Electric that handles light as well as the naked eye. SureVision incorporates Wide Dynamic Range, LowLight and Anti-Bloom capabilities into a single technology. Sarix cameras featuring this technology simultaneously adjust to bright light, low light and back-light to deliver the best possible image in the most difficult lighting conditions. 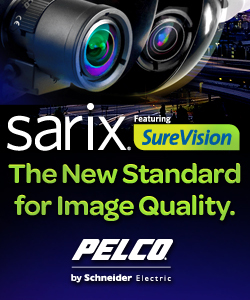 SecurityStockWatch.com: On your website www.Pelco.com it says, Sarix is a groundbreaking technology platform that defines the next generation of imaging performance. Please give us an overview of Sarix. Scott Paul: I guess the easiest way to answer that question is to look at the three pillars of Sarix technology. The first is Imaging Science. Sarix delivers best-in-class image quality with advanced lowlight capability and consistent color science. The next pillar is Industrial Design. Simply put, this means that the cameras are designed to save time and money on installation with features like Auto Back Focus (ABF), a service jack and the mini/micro SD card. The final pillar is Processing Power. Sarix features High-Profile H.264 compression for optimized image quality and minimized bandwidth. Sarix also enables users to run both Pelco and OV Analytic suites. SecurityStockWatch.com: Lets talk about the Sarix value proposition. What are the financial advantages of Sarix, especially during these challenging economic times? Scott Paul: Sarix cameras are designed to maximize value. They are competitively priced and offer advanced features like ABF, CS mount lenses and built-in Pelco Analytics. Our Sarix IM Series Mini Domes are particularly value-driven, offering the advanced technology of Sarix at the most affordable price point. And getting back to the Industrial Design pillar of the technology, users save time and money with ABF and the Analog Service Jack. With these features, installers can auto focus the camera remotely, saving them an additional trip up the ladder. This is a real advantage over the competition. Finally, Pelco by Schneider Electric provides a complete end-to-end solution featuring Sarix fixed IP cameras, Spectra HD, IP and Analog PTZ domes, and IP ready Video Management Systems. By investing in the complete Pelco by Schneider Electric system, customers can ensure an integrated, robust and fully supported solution by one provider, saving time and expense on installation system integration. SecurityStockWatch.com: Congratulations on the Pelco by Schneider Electric success story at The Greenbrier Casino Club in West Virginia. SecurityStockWatch.com: Without divulging any confidential information, of course, can you tell us about the solution Pelco by Schneider Electric provided here? Scott Paul: We were able to provide an extremely powerful and flexible solution for this world-class resort and casino. In addition to their nearly 700 guest rooms, meeting facilities and three championship golf courses, Greenbrier recently added a 103,000-square-foot casino. We were able to create a virtual matrix installation with Endura 2.0 that allowed them to seamless tie the new 400 IP cameras protecting the casino with their existing analog system. They are using both Sarix and Spectra IV IP cameras with great success. SecurityStockWatch.com: Thanks again for joining us today Scott. Are there any other subjects you would like to discuss? Scott Paul: Thank you, its my pleasure it talk with you about Sarix and new SureVision. Its such an amazing advancement for the industry, I encourage your readers to visit our website, www.pelco.com/sarix where they can view video comparisons and learn more about this new technology.